With any new technology or tool, special words and phrases develop to refer to the unique features and uses of that tool. While it is easy to dismiss these “buzzwords”, the smarter decision is to learn what they mean and how to use them properly. Doing so will ensure you actually understand the tools your business has at its disposal - and also lead to better investments in new technology. 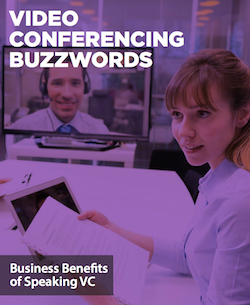 If you’ve ever felt at a loss when it comes to the technical side of video conferencing, read this guide on breaking down the most common Video Conferencing Buzzwords.